Custom Made German Silver, 14K Gold and 6 Rubies. 3 Piece Belt Buckle Set Made by Eddie Bohlen. Paid $22K Last Custom Buckle Set Bohlen supervised and stamped before company was sold and moved to Texas. Quality, Weight and Ruby Color Have Not Been Matched Since. 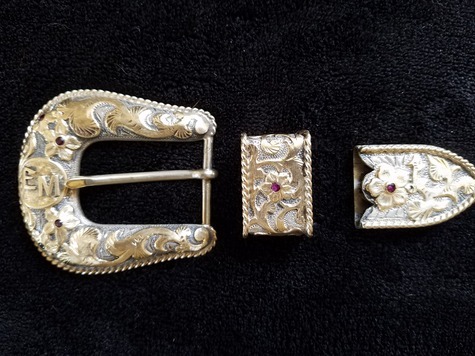 These Western Style Buckles Were Made for John Wayne, Clint Eastwood and Many Hollywood Stars, Executives and Sports Figures in Beverly Hills.